I think I spoke too soon when I extolled the wisdom of the American people last week. Despite having improved upon the Paulson plan they shot it down yesterday. They called and wrote to their congressmen to express their outrage and their congressmen, afraid they would have to get real jobs after the November elections, voted against the plan. The stock market reacted quickly – to the tune of wiping out $1.2 trillion of wealth in one day. As some commentators have noted this is more than the amount of money being considered for the bailout. What I find frustrating in all this is the lack of understanding about this bailout package. For instance, people talk as though $700B is the cost of the plan. But it’s not. It’s just the amount of money being put at risk. The cost will be the amount of money lost between what the government pays for the assets and what they can ultimately sell them for. By many accounts the cost will be negative – i.e. the government will actually make money on the deal. 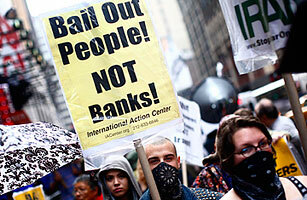 As if bailing out a bank is not bailing out the people? Frederic Mishkin, a former Federal Reserve Board Governor (I took a money markets class from him in business school) had a great story to tell on one of the Sunday talk shows this last weekend. His grandfather owned a store when the stock market crashed in 1929. His grandfather delighted in the fact that those wall street guys got what they deserved. One year later his grandfather was out of business. Villa Taj, BACK ON THE MARKET!